Grant Dawson's weekly look at who crushed it, and who needs to kick it up a notch. Dylan Ferrandis is the latest rider to come to America after racing the MXGP World Championship for several years, and he's been pretty impressive so far. Now no one was doubting the Frenchman's speed coming into the season. He has won GPs, after all. 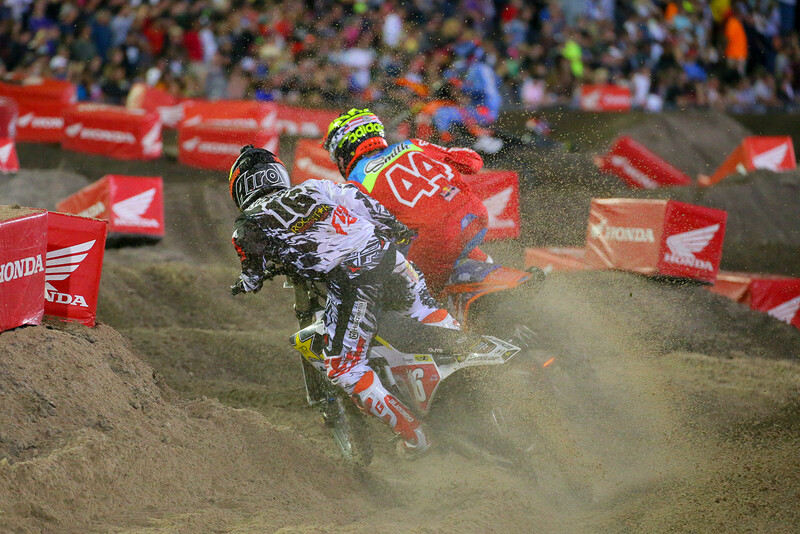 But what many of us were questioning was his lack of Supercross experience and his race stamina. Well, he's answered those questions as he's been up front in nearly every main event and he got his first podium of the season at one of the roughest (not to mention one of the longest) races of the season. I think that a win might be a bit of a stretch for him this season, but he could definitely land on the podium a few more times before the season is over. Yamalube Star Racing Yamaha took a big risk by bringing him over, but so far it is paying off. Wacko Zacho was riding a little crazy out there on Saturday. 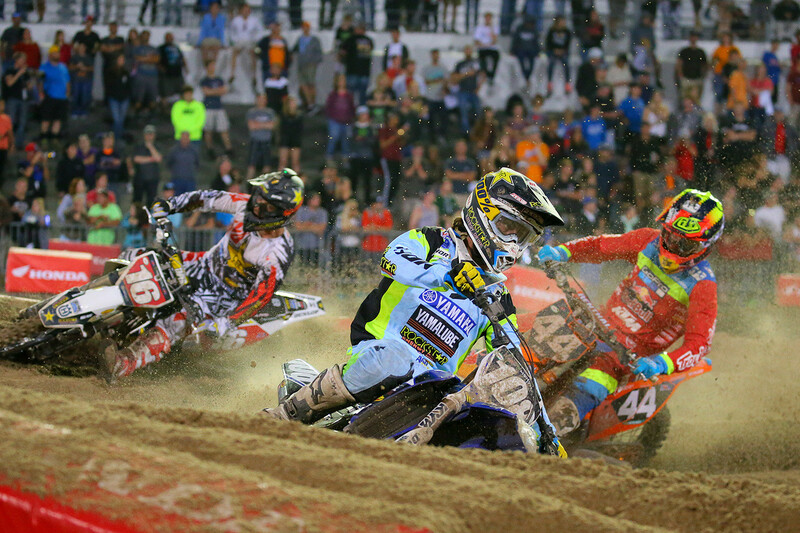 A bad start and some mistakes put him as far back as eighth at one point, but he was determined to salvage some points and rode his way back to fifth. He almost had fourth as well, but Jordon Smith was able to hold him off at the very end of the race. It was a nice charge after he re-grouped, but my goodness, he looked very sketchy out there. He had already crashed once by the time he started his charge–and really it looked like that he could have crashed two or three more times during his charge. Anyway, it wasn't really a bad ride. What's bad is that he lost some valuable points to both Joey Savatgy and Adam Cianciarulo. He had a pretty comfortable points lead coming into Daytona, but it isn't so comfy anymore. He's going to want to get a good start and minimize the mistakes next week. 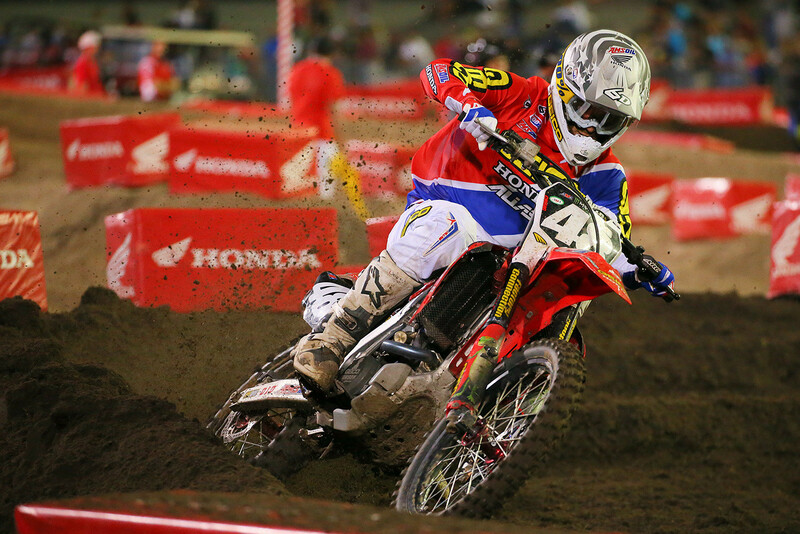 Christian was GEICO Honda's lone 250 rider this week, and it didn't go so well. Unfortunately, I wasn't at the race and they didn't show him once on the broadcast so I'm not sure if he just got a bad start, or if he crashed early in the main, but he was as far back as 18th at one point, and finished in 14th place. My guess is that he had his early race issues, whether it be a crash or bad start, and then he continued to have problems as he tried to make his way towards the front (basically a similar situation to Minneapolis). So the moral of the story here is that Christian cannot start towards the back. If he does, well, he'll probably finish towards the back. The rough 250 season GEICO Honda has been having isn't getting much better, folks. Hopefully the black cloud stops hovering over the team one of these days. Colt didn't even make it to his heat race in Daytona. He hurt himself Thursday, and after trying–and failing–to ride free practice he decided to pull out. Bummer deal for both Colt and his team. Let's not forget that he looked extremely fast this season even though he had very little preparation time due to a broken femur he sustained during the preseason training. Had he come into the season healthy and stayed healthy, this championship could be looking a little bit different... But unfortunately we'll never know. Heal up quick. Colt. I'll admit, I was very unsure of how Jeremy would do on a 450. He's a smaller guy, and even though that hasn't stopped some guys (cough) Carmichael (cough), I was afraid that he would struggle to adjust to the bigger bike, especially since he only had eight days on the bike before the race. Well, he killed any doubts I had when he qualified second, and then followed that up by leading the first ten laps of the main event and finishing second. A very, very impressive ride by Jeremy. Now I can't wait to see him on a 450 next year. Ryan Dungey rode one hell of a race to come from 17th to fourth place, but he still lost some valuable points. The gap between him and Eli Tomac is now down to 17 points. That's still a nice cushion, but if Eli keeps winning it's going to keep coming down at a fast rate. This title chase isn't over yet. And I don't know about you, but I'm down to watch a close championship battle between Eli and Ryan. Hopefully it happens. Marvin was sick last week and I think he was still feeling some of the side effects this week. A bad start combined with a crash in the main event led to a 15th-place finish. The extra rough and long main event probably didn't help him any if he was still feeling the effects of being sick. In the end it was another bad weekend for Marvin, but hopefully he'll be back to normal and running up front in Indy. It's always weird when a factory rider doesn't make the main event. This time it was Justin Bogle who didn't make the cut. He didn't transfer out of the heat, crashed during the semi, and just got a terrible start in the LCQ and ended up sixth. So, uh, I think it's safe to say that it was not a great night for Justin or RCH Suzuki. Really it hasn't been a great season as a whole for Justin or the team, either, as injuries and crashes have held him back from living up to his potential. Hopefully he grabs a couple of impressive finishes before the end of the season, or else he might be a free agent this coming year. We absolutely hate it when riders get injured, but it's even worse when it's someone like Jimmy Albertson, who is widely respected and liked by the industry and competitors alike. 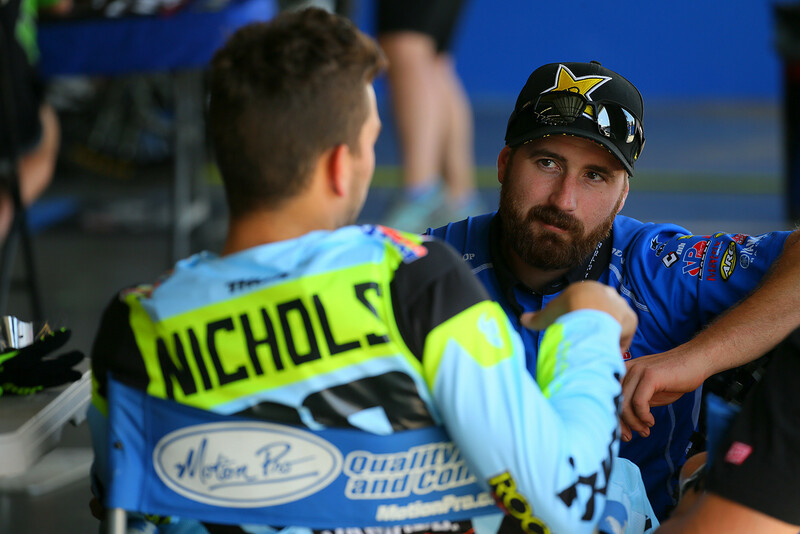 Daytona marked Jimmy's return to the series after taking a couple of weeks off to work on his Supercross skills. It seemed like he made some progress over those two weeks and was ready to finish out the season strong, but then disaster struck. He went down hard during the final qualifying session of the day and ended up with a laundry list of injuries. I mean, just read this list: bilateral patchy lung contusions, a left metacarpal fracture, fracture of the manubrium and body of the sternum, fractured T5 through T7 vertebrae, compression of the T4 through T6 vertebrae, and epidural hematoma at T5 vertebrae. Good golly, Mister Albertson! That's a big list of a bunch of painful injuries. On the bright side, Top Jimmy seems to be in pretty good spirits right now, and we're sure he'll get through this and get back to racing as soon as he can. If you would like to donate to Jimmy's recovery fund, click here. Looking at the picture of Marvin Musquin, I'd say it looks like he's still sick. Did you really think Ferrandis was "a big risk" for Yammy? Did you see how fast he was last 2 years in europe? I consider it a sizable risk any time a team brings over a rider from the GPs, regardless of said rider's speed/skills. Sometimes it works out, and sometimes it doesn't.